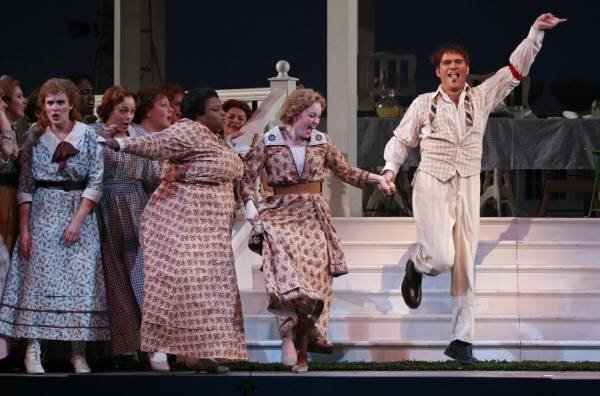 Olin Chism reviews Elixir of Love at Fort Worth Opera. Includes links to other reviews. There was charm aplenty when the Fort Worth Opera opened the first full weekend of its 2010 festival on Friday night. Exceptional voices, acting, stage direction, scenery, costumes and lighting blended to give sparkling life to what is probably the cutest opera Donizetti ever wrote, The Elixir of Love. In this good-natured tale, a poor young man is desperately in love, but the woman of his dreams basically ignores him, preferring instead a hunkier rival. A con artist passes through town, selling nostrums for whatever ails his naive victims. The young man buys an “elixir” to redirect his beloved’s affections and his fortunes immediately change (is there any other 19th-century opera that uses the placebo effect as a plot device?). All ends happily, of course. The parts of the two young lovers were in excellent hands Friday night. Tenor Michael Fabiano and soprano Ava Pine both were stagewise and caressed the ear with pleasant sounds. Pine, who has a gorgeous voice, has been a major asset in the Dallas-Fort Worth area for a long time. It’s great to hear her in a leading role. Baritone Christopher Bolduc and bass Rod Nelman as, respectively, the rival in love and the nostrum peddler rounded out the quartet of principals with vivid performances. The remainder of the cast, including the chorus members, were a lively supplement, and the orchestra under Stewart Robertson’s command gave solid backing. This production is transferred from early 19th-century Italy to early 20th-century America, a move that does no harm at all. I love Allen Moyer’s scenic designs, which include a folk-artish curtain (Grandma Moses would be pleased), a gazebo with patriotic banners, a vintage truck, an old motorcycle with sidecar, and a football team with those quaint old leather helmets. With Martin Pakledinaz’s period costumes and Paul Palazzo’s effective lighting, they created a bright, cheerful ambiance. Jennifer Nicoll’s clever, on-the-mark stage direction was a decided plus. The Fort Worth festival continues this weekend with the world premiere of Before Night Falls on Saturday night and Don Giovanni on Sunday afternoon. There will be further repetitions next weekend. FYI, After seeing the inimitable Dallas treasure Lee Cullum’s interview on CEO w/Ft.Worth Opera’s director, I intend to become a patron. And I am generally bored (to tears) w/ opera although I have seen it myriad times (including as a kid the Callas debut in Dallas, etc. so eat your heart out & don’t sue me). That’s how absolutely charmed I was with that entire interview & his back story & that of the FW Opera istelf.